In April 2016 it was announced that the much-anticipated bid to redevelop LeBreton Flats was won by RendezVous LeBreton Group’s Illumination LeBreton. It’s hard to believe that after decades of near-vacancy and intense competition between developers a plan has been made for the land’s future. So, what is Illumination LeBreton and what does the RendezVous LeBreton Group promise that is more favourable than the opposing developer Devcore Canderel DLS Group proposal? The development slogan boasts of “Linking, Connecting and Completing” and it promises to celebrate the past while inspiring a bright future. Illumination LeBreton’s main design principles are Heritage, Connectivity, Vibrancy, Sustainability and Place-making. RendezVous LeBreton promises to harness LeBreton Flats and the city of Ottawa’s cultural, political, economic and entrepreneurial spirit which was originally fostered by the industrialists of Chaudière Falls over a century ago. 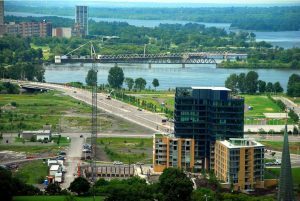 As a central region, Illumination LeBreton will also strive to connect each adjacent neighbourhood, from downtown near Parliament Hill to the west’s Nepean Bay Inlet as well as Gatineau across the river. RendezVous LeBreton describes the area as “the final linking piece of a great puzzle”, creating an infused dynamic between the joining historic regions. Illumination LeBreton will embellish Ottawa’s personality and energy through innovative urban space, districts and street activity. 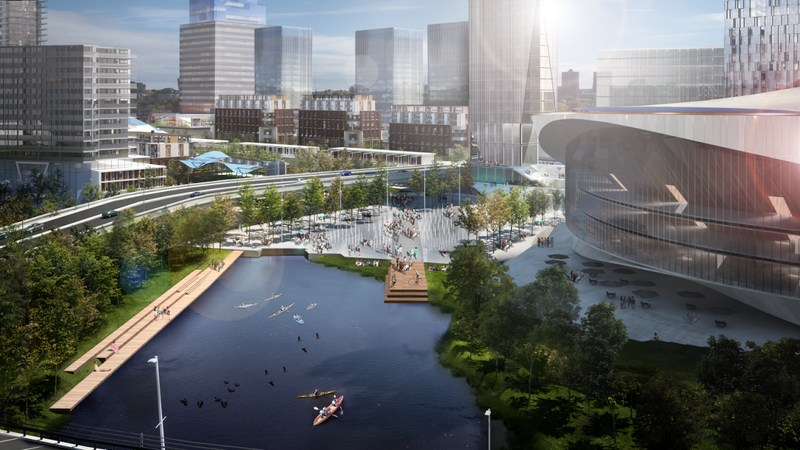 Optimizing the region’s varying climates, the development will focus on maintaining sunlight, both indoors and outdoors, and introducing seasonal activities like outdoor festivals in the summertime and a skating canal in the winter. Consequentially to the location of LeBreton Flats, Illumination LeBreton will focus on long-term sustainability for the 21-hectare region. 1.2 million cubic meters of contaminated land will be treated and revitalized while environmental stewardship and sustainable living will be avidly promoted by residential and commercial stakeholders alike. The “One Planet Action Plan” devised for Illumination LeBreton actually has ten principles with aspiring and attainable goals aiming for long-term environmental and social improvements in all aspects of an everyday lifestyle. The fifth and final intent for Illumination LeBreton lies within Place-making. As RendezVous LeBreton Group puts it, “the greatest urban environments around the world are places – neighbourhoods that have memorable characteristics and identifiable personalities. These places are an energized blend of iconic architectures, sublime public spaces and exciting or pleasing activities. They are places where people are proud to live, where people are drawn to and where the cities’ identities are framed and formed.” This is the primary end goal of Illumination LeBreton and it plans to be executed in three phases over 10 years. What exactly will Illumination LeBreton incorporate to create such innovation, connectivity and distinction in the City of Ottawa? RendezVous LeBreton’s proposal includes public anchors like the Major Event Centre, Sensplex and Abilities Centre and non-public anchors like commercial, retail and residential components, including affordable housing. The biggest draw is the 18,000-seat Major Event Centre (MEC) which joins the adjacent LeBreton Square capable of holding a whopping 28,000 more civilians. The MEC will be an incredible facility and a new capital landmark for the city of Ottawa. With year-round public access and events catered to the entire city demographics, the Major Event Centre and LeBreton Square have the potential to restore civic life in the remarkable district. Furthermore, the MEC promises new views of the city, including Parliament Hill and the Ottawa River, from its glass-walled exterior and groundbreaking green roof project. However, the most important and enticing aspect of the MEC is its proposed tenant: the Ottawa Senators. In a country like Canada, the capital’s National Hockey League is quite the rage and fuels the city’s spirit. However, their current home is a 30-kilometre drive outside the city center. During peak events like Senator games and popular music tours, the trek out to the Canadian Tire Center can be slow, aggravating, and to some locals, sadly not worth it. Illumination LeBreton will have a community-use ice rink facility a few steps from Ottawa’s downtown core. It will consist of two NHL-sized hockey rinks, being the Ottawa Senator’s home for practice and games and is a viable place to host national and international hockey tournaments. The potential for local spirit and economic growth is not only exciting but exactly what Canada’s capital needs. Attached to the Sensplex will be an Abilities Centre, the second of its kind in Canada. It will be a community centre that focuses on sports, recreation, arts, music, dance and life skills improvements. It will also incorporate a centre of excellence for people with disabilities. Furthermore, the MEC is expected to bring 175 events per year, roughly 30 more than the current Canadian Tire Centre. Only 30% of these events are hockey related, leaving room for many more performances catering people of all ages and interests. The MEC and joining Sensplex and Abilities Centre will be located directly between the Pimisi and Bayview LRT Stations. Walkways both on and above ground will connect the three important landmarks, making every aspect of the surrounding area easily accessible to the public. 80% of the expected crowd will arrive by public transit, bike or foot, however, there will also be over 8,000 underground parking spots in the area. Another unifying aspect is the LeBreton Flats aqueduct that has been so sadly neglected over the years. It will become a historic anchor in Illumination LeBreton and will transform the water channel in an iconic new public space with a boardwalk, cafes and retail space. In the winter the aqueduct will become a public area of outdoor skating, similar to the Rideau Canal. Other public anchors within Illumination LeBreton includes a Multimedia Nightwalk, Canadian Science and Technology Museum, a new home for the permanent installation of the Governor General’s prestigious National Honours Awards and a revamped home base for popular events like Ottawa Bluesfest and the Ottawa Race Weekend. Lastly, the proposal includes a new Ottawa Central Library which will sit on the corner of Albert and Booth Street which will become a new and beautiful destination in of itself. Although commercial and residential plans aren’t concrete, the Illumination LeBreton proposal includes a hotel with 800 suites as well as 4,400 residential units. An impressive portion will be dedicated to affordable housing thanks to RendezVous LeBreton’s partnership with the not-for-organization Centretown Citizens Ottawa Corporation. After reaching full completion of the project by the planned date of 2026, Illumination LeBreton will have up to 12,000 citizens working there and around 7,000 residing in the area. The runner-up in the LeBreton Flats redevelopment bid was LeBreton Re-Imagined by the DCDLS Group. It included a Canadian Communication Centre and Ottawa Public Library, both similar to Illumination LeBreton, as well as a Canadensis Walk acting as a uniting feature to enrich the social and cultural draws for visitors. However, the main difference was a proposed “World Automotive Experience” Museum. This was instead of the NHL Sens headquarters and a lot less exciting than a new home for the locally praised hockey team. The main issue with the LeBreton Re-Imagined redevelopment plan was its lack of confirmed tenants. The selection committee was worried about minimal support and information for the financial viability of the public anchors. Although Illumination LeBreton also lacked concrete investors, the committee knew that a Sensplex arena and similar ventures were successful from previous models established in the region, such as the current Canadian Tire Centre. Not only was an automotive museum a whole new idea, but it lacked the lustre that the Sens would definitely bring downtown. Another important advantage the Illumination LeBreton had was better overall planning. The MEC’s location is perfectly placed between the Pimisi and Bayview LRT Stations near LeBreton which supports their “connectivity” design principle. The selection committee also preferred the divided districts of Illumination LeBreton and plans to cover the LRT tracks, making the area walker and biker friendly. They felt the opposing LeBreton Re-imagined lacked innovation and that the use of big city blocks would minimize the “walkability” flow of the area. The “social sustainability” of Illumination LeBreton was an easy winner in contrast. Nevertheless, there is still uncertainty about the redevelopment as a whole. Officials speculate that Illumination LeBreton’s original proposal is expected to change as planning moves forward. There are also many questions about overall cost, somewhere around $3.5 billion, and the timeline of the entire project from start to completion. The NCC and RendezVous LeBreton Group must still get together and negotiate. With a piece of land that has taken so long to even reach this point, one can assume that negotiation will not be a short and easy process. Only time will tell so stay tuned as more details regarding Illumination LeBreton unfold! LeBreton Flats Redevelopment: Are First Nations Coming Second? In late January, it was announced that Illumination LeBreton was the highest ranking proposal for the LeBreton Flats redevelopment. Favoured by most, RendezVous LeBreton Group will proceed in their 3-phase expansion of the massive plot of land. However, there is still one stakeholder that needs to be consulted: The First Nations people. LeBreton Flats has a deep connection with the Indigenous people of the region who first discovered, used and cared for the land before industrialists took over. In the present day, the Flats are regarded as traditional Algonquin territory and any use of the land must be negotiated and approved by First Nation officials. There have already been two meetings in late January and early February between the First Nations, the NCC and developers. Chiefs and other ambassadors from ten different Algonquin communities gathered to discuss the future plans for their sacred land. Of course, with consultation comes some controversy. The first meeting was scheduled to be a presentation by promoters for the development, however, things took a defensive turn. Algonquin representatives told the presenters to leave. They wanted to discuss the plans alone with just the Nation Capital Commission. Chief Lance Haymond of the Kebaowek community voiced his displeasure with RendezVous LeBreton and their failure to collaborate with the Algonquin people given the sacredness of the land. Chief Haymond states that “[the developers] have failed in the duty to consult and accommodate [us] given it is a sacred site for the Algonquin.” Still, he made it clear that all blame should not be placed on RendezVous LeBreton Group. He reminded “[the NCC that] it is not the promoter’s responsibility to consult, it is the federal government’s responsibility.” Both parties, being the developers as well as the government of Canada, are at fault here and the Indigenous community must stand up for their rights. It is not the first time they have failed to include the First Nations in major plans. Previous developments at the Chaudière Falls by Windmill Development Group lacked consultation. Furthermore, a November 19, 2015 resolution was passed by the Assembly of First Nations of Québec and Labrador that deemed all levels of government are violating Canadian law by changing the status of land without meaningful dialogue and acculturation of the Algonquin communities. However, the road goes both ways. Even though First Nations feel overlooked, an effort has been made both federally by the Prime Minister, Justin Trudeau, and municipally by the country’s capital to recognize that the “land within the boundaries of the City of Ottawa lies within the history Algonquin Territory.” This was both outlined in the city’s “Official Plan” document of 2011 as well as at the December 2015 Assembly of First Nations held by Justin Trudeau. With all this in mind, the Indigenous community is not against redevelopment. They simply want to ensure that the incentive behind LeBreton’s regrowth will also benefit the Algonquin communities. Chief of Pikawakanagan First Nation is seeking meaning and innovation in LeBreton Flats. This means “not just street signs and some plaques… We’re looking for and seeking some significant benefits” he states firmly. Months after the controversial gathering with the NCC and First Nations, the City of Ottawa announced that the first Light Rail Transit stop west from downtown will be named Pimisi. Extremely well received by Indigenous representatives and communities alike, Pimisi means eel in the Algonquin language, with sacred significance being a source of spirituality, medicine and food. Public murals and mosaics will be created by Algonquin artists and an authentic eel statue will also be incorporated in the station. In terms of LeBreton Flats, long-term strategy and economic development are amongst the opportunities the city can provide First Nations people. They’re hoping for relevant benefits beyond generic employment and training, however further consultation and negotiation is necessary. The NCC and RendezVous LeBreton Group have tentative meetings with First Nations scheduled on the LeBreton Flats development timeline before anything is finalized. The Algonquin community may be cautious for now but there is plenty of time to incorporate their history and needs into Illumination LeBreton. Most facts and dates extracted from Leveller.ca’s article Ten Algonquin Chiefs Meet With NCC Over LeBreton Flats and Zibi Project. The LeBreton Flats redevelopment has been quite the topic of conversation in Ottawa’s municipal news. Something exceptional is about to hit the 84-hectare region that sits a mere 20-minute walk from Parliament Hill, and it is about time! The majority of LeBreton Flats’ sprawl has sat virtually empty for decades. Why? Let’s take a look at the rich history buried beneath the soil of Ottawa’s most talked-about land. Much before hockey stadiums and condo towers were in demand, sacred ceremonies were performed at the Chaudière Falls by the First Nation people. Indigenous groups including the Algonquin, Huron and Iroquois would conveniently set up camp around the corner on LeBreton Flats. Nevertheless, the harmless and pure nature of the First Nations could only last for so long. Both Europeans and Americans started setting foot near the grounds in the early 1800’s and it wasn’t long until industrialists decided to capitalize on the powerful Chaudière Falls. Robert Randal of Maryland, USA, purchased the Flats, known as Lot 40 at the time, in 1809 for paper milling purposes. Soon after, he went bankrupt and his land, full of potential, sadly sat empty for the next few years. During the War of 1812, plans were made to connect the Ottawa River and the lower Saint Laurence River with a military canal. Royal Engineer and British Surveyor-General Joshua Jebb gathered that a canal was achievable once improvements were made to the Ottawa River in order to direct it toward the Chaudière Falls. Construction began in 1818 and in 1820 George Ramsey, the Earl of Dalhousie, toured the area with the idea of the canal addition in mind. He knew that the Richmond military settlement officers needed a place to safely store their cargo and equipment away from the weather, wildlife, and burglars. Shortly after noticing the potential of all the empty land, he publicized his idea to purchase Lot 40 at an officer’s dinner. Captain John LeBreton was in attendance that evening. Captain John LeBreton was England-born but raised in Newfoundland and at the time was residing in the Nepean Township of Britannia, Ottawa. Living so close to Lot 40, LeBreton decided to pursue the lucrative plot of land without Dalhousie knowing. In 1820, he discovered Lot 40 was being sold in Brockville at a sheriff’s sale. Needing more capital to invest, LeBreton teamed up with a Brockville lawyer named Livius Sherwood. They purchased the land for £499 (approx. $835 CAN) from the newly-released but severely in-debt Robert Randall. Lot 40 was understandably renamed LeBreton Flats and Sherwood Heights. The cheeky LeBreton then went to Dalhousie and the government and offered to sell his eponymous piece of land for £3000 (approx. $5,024 CAN). Absolutely infuriated, Dalhousie rejected his offer after realizing the man had scammed him. An intense feud began and Dalhousie assured LeBreton that the government would never purchase the Flats; Dalhousie took this grudge to his grave. As a result, the canal was hastily moved to Entrance Bay, the current location where the Rideau Canal joins the Ottawa River. The overall cost of construction was significantly higher as extra locks and a longer route for the canal was necessary. To further redeem himself, Dalhousie also purchased a piece of land called Fraser Parcel which soon became the village of Bytown and Barracks Hill, the future location for Parliament Hill. LeBreton earned a notorious reputation in the region, however, he is said to be one of the only people to fully recognize the land’s potential and future commercial value. Over the years, LeBreton and Sherwood began dividing their land into smaller portions and selling them to reap huge profits. By the mid-1800’s, LeBreton Flats was a fully functioning and well-established lumber mill community. 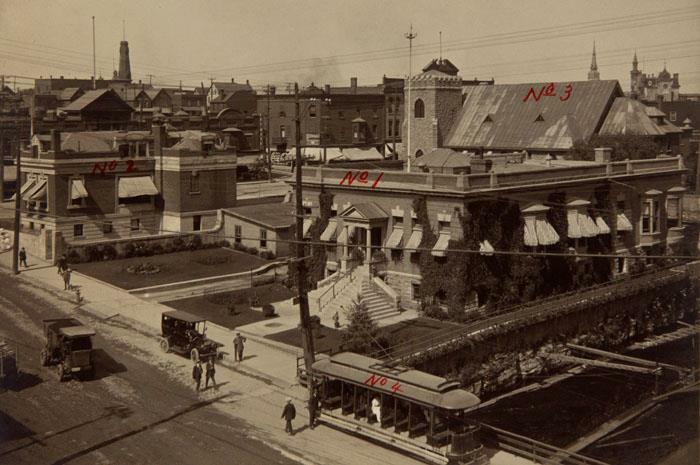 While there was residential housing for workers and owners alike, a rail line including a station and yards were built to fuel industrial development. Hotels, taverns and other community-oriented stores were also open for business to the local population of LeBreton Flats, Chaudière Falls and Victoria Islands. Sawmills were established at the falls and the land encompassing Chaudière became lumber yards with a plethora of wood piled up to dry out. On April 26, 1900, there was a defective chimney that caught fire across the Ottawa River in the heart of Hull, Quebec. Although fires were common and manageable, an intense wind began causing incurable problems. Soon half of Hull was burning and the south-travelling fire was rapidly heading toward Ottawa. Once it reached the E.B. Eddy Pulp and Paper Plant there was no point of return. Flames spread across the Chaudière Falls to the numerous lumber yards set on both sides of the Ottawa River. Stacks of lumber transformed into one huge bonfire. The wind died down by midnight, but 14 hours of fire had done irreversible damage. Two-thirds of Hull was burnt to the ground and 440 acres sprawling from the Chaudière Falls to Carling Avenue on the Ottawa side was destroyed. Although only seven civilians were killed, 15,000 were left homeless as 3,000 buildings from Hull to Ottawa became piles of rubble, splintered wood and melted steel. The regions suffered an estimated $10 million in damage. LeBreton Flats was once an endearing community to build a home and set up shop in. After the devastating fire of 1900, the region was rebuilt but locals were scared of repeating events. The Flats became a purely industrial area and the only residents living there were workers with nowhere else to reside. 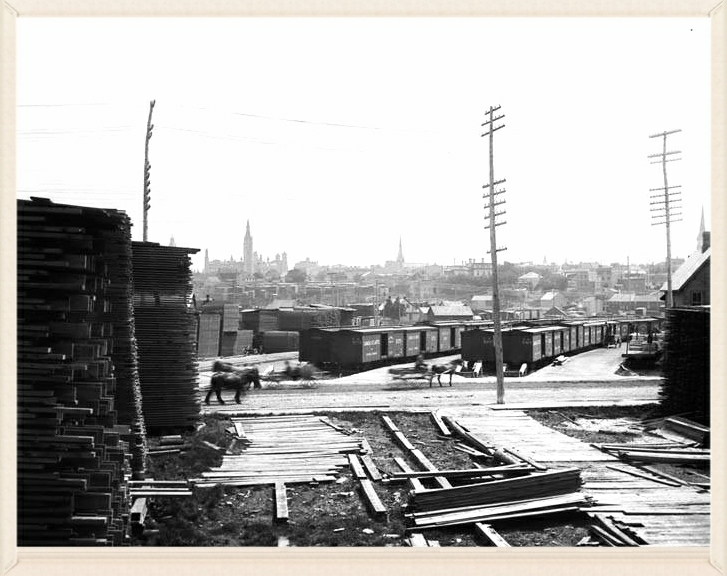 LeBreton Flats became an industrial desert of train yards and lumber production for decades. Fast forward to 1962, the Diefenbaker government was working on gentrifying the area, which didn’t fit into the prestige of Canada’s capital. Officials planned to spruce up the area with a new defence headquarters and offices for the Government of Canada. On April 19, 1962, all residents of LeBreton Flats and the direct surrounding area received notice of expropriation to beautify Ottawa’s central area. Roughly 2,800 residents in the 150-200 acres were forced to vacate their homes and make way for demolition. By 1965 the last of the houses and small businesses were gone, with the teardown costing a total of $15 million. However, there were many conflicting viewpoints on the use of the land and soil contamination from the stakeholders of the redevelopment. Intense disputes between the National Capital Commission and the municipal government lead to figuratively demolished plans. For over four decades, LeBreton Flats lay vacant. It was primarily used as a snow dump during Ottawa’s brutal winters, while runoffs from the excess snow caused further contamination to the land. Fast forward again to the 2000’s. The Canadian War Museum opened on a northern section of the LeBreton Flats redevelopment in 2005, the first actual initiative of the LeBreton Flats redevelopment that the city had seen in years. It is currently home to a multi-residential development, Mill Street Brew Pub and a connection of pathways for buses, bikes and cars. 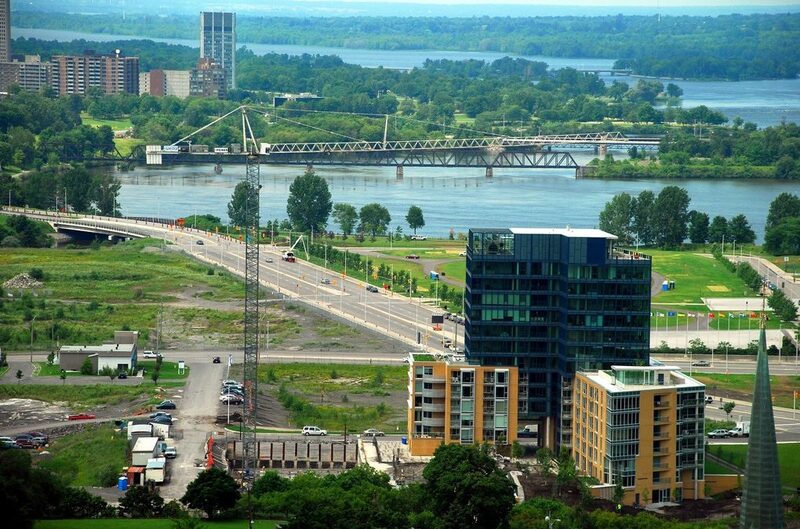 Ottawa’s popular 12 day Bluesfest festival grounds are also located at the LeBreton Flats redevelopment site. Furthermore, Canada’s National Holocaust Monument and the city’s first Light Rail Transit System will be situated there as well. So, with all this in mind, 2016 will be one for the books with the LeBreton Flats redevelopment! The NCC accepted applications for the LeBreton Flats redevelopment in the area in December 2015 and the RendezVous LeBreton proposal won the hearts of officials. The three-phase development will take years, even decades, to complete but for the first time in centuries, the LeBreton Flats redevelopment has concrete plans to finally live up to its original potential. Historical facts and dates extracted from Leveller.ca’s Article The Ugly History of LeBreton Flats Article and NCCWatch.org’s The Blunder: LeBreton Flats article.